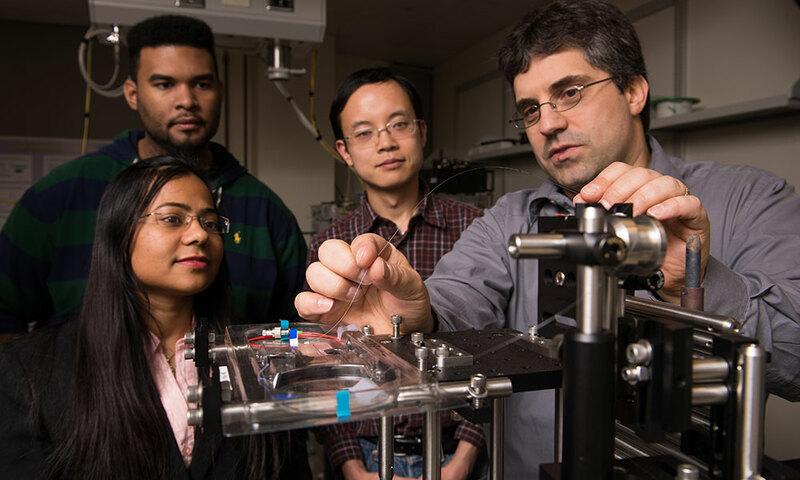 John Marciante, an associate professor of optics, and the University’s Institute of Optics, is working with venture capital-backed technology company, FemtoRoc Corp., to develop those more powerful lasers. His contract with the company, expected to take six years, has a research budget estimated at $10 million. Guo and Vorobyev have successfully used this technique to create not only metal surfaces that are extremely water repellent, but ones that attract water as well. Guo’s laboratory has also created a process to treat metal surfaces to absorb virtually all wavelengths of ambient light and which has a wide array of commercial applications, including thin, ultra-efficient solar cells. However, it takes about an hour for Guo’s laboratory to pattern a 1-inch-by-1-inch metal sample using commercially available, low-powered lasers. More powerful, ultra-fast femtosecond laser pulses are needed to speed up the process to make the technology commercially viable. To develop the lasers, Marciante’s laboratory, which specializes in developing advanced, high-power, fiber lasers, will need to address two main challenges. One is that laser beams are usually confined in conventionally designed optical fibers, which tend to be very small in core diameter. In scaling up the laser power, too much light becomes concentrated in the fiber’s core, and nonlinear properties proliferate, causing the laser beam to broaden or become modulated. The second challenge is overheating. “You’re pumping the laser beam at one energy level, at one end, and then extracting it at a lower energy level, at the other end, and no process is 100 percent thermally efficient. So that extra energy ends up in the fiber. The fiber can get very hot, even to the point of melting,” Marciante says. “It’s a very exciting challenge,” Marciante says.